Your donations are tax deductible, and any financial support that you can provide will be greatly appreciated. The Hubbard Free Library is a community. It is a shared experience that can be enjoyed by everyone. Whether you are raising children, looking for a job, exploring medical research, hunting for the latest best seller or rare book, the Hubbard Free Library is the place to experience new ideas, learn new things, meet friends and neighbors, and to indulge your imagination. Everyone has his or her Library story. Many love the building, others the smell, the staff and so on. 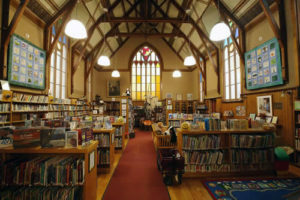 For more than 135 years, the Hubbard Free Library was and is the place in Hallowell to explore, interact, and discover. The Hubbard Free Library offers multiple programs including parenting workshops, book clubs, free Internet, tech support, and children’s books and reading programs. Young and old depend upon the Library for free access to resources like Ancestry.com, a quiet place to work or relax, and for that ineffable sense of being part of a grand and lasting enterprise. This year our Summer Reading Program had over 100 participants and more than 800 books were read – up 250 percent over last year. But, we need to do more. And, we want to do more. To do more we need your financial support. We are kicking-off our 2018 Annual Fund Campaign to continue to build our Library community and to inspire and educate you about local issues, art and music, and civil discourse. We need your help to make this all happen. Our 2018 Annual Fund goal is $40,000. We hope you will consider renewing your support or becoming a first-time donor. Every gift contributes to keeping the Library open and its programming and resources available to the community. No gift is too small. The Annual Fund Campaign is the Hubbard Free Library’s single most important source of funding. It provides critical day-to-day support to keep the Library growing and thriving. Your gift also counts towards creating a greater sense of sharing in our Library community. In a changing world, the Hubbard Free Library provides the cultural and community connections that are more important than ever. P.S. The Annual Fund Campaign ends on December 31st so please make your gift today! Do you want to honor someone special in your life or thank someone for helping out? Do you need a gift for that person who has everything? Why not buy a book? 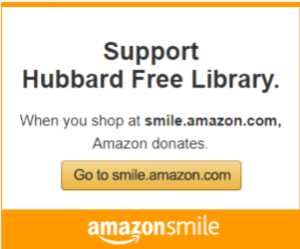 The Buy-A-Book campaign benefits the Hubbard Free Library. For a gift of $25, a book will be purchased to add the Library’s collection. A bookplate will be placed inside the front cover with your name or the name of the person you designate on it. This campaign allows you to contribute to the Library’s book collection. As the Library’s membership grows each year, the need to increase the collection outpaces the Library’s budget. This is where you can help. Your gift will place books into people’s hands reach so many: the a littlest preschooler child who is just beginning learning to read, the a teen writing a book report, with an impending book report or the or an adult looking for the latest bestseller. Please consider supporting support this campaign. You can choose the category of you would like purchased or have your gift will be placed in the general fund which will be used toward to help meet the Hubbard’s greatest needs. Yes, I want to help buy more books for all readers! Your donation will buy books for the Library to be enjoyed, teens, adults and you! As a thank-you, your name, or the name of the person or organization you choose to honor, will appear on a special bookplate in a new book. There are many opportunities for volunteering at the Hubbard, including, but not limited to: re-shelving books and other items, assisting at our weekly Children’s Hour – reading to children; helping with arts and crafts activities -, or serving as a computer guru. Stop by and see if there’s something you might like to do. The Friends of the Hubbard Free Library sponsor both adult and children’s programming throughout the year. Annual membership fees, as well as fund-raising events such as books sales and raffles, make a wide variety of programs possible. The group has also supported the library in other ways in the past: providing a new sign for out front, a refrigerator, two computers, an adjustable crafts table for the Children’s Room, as well as Leo the Library Lion (the kids love him). They provide refreshments for all events, prizes for our Summer Reading program, keep the library looking warm and welcoming with plants and other decorations, and take on various special projects from time to time. All are welcome to attend the meetings, the fourth Wednesday of every month at noon in the library. Bring a bag lunch, and help brainstorm ideas for programs and fund-raising events! If you are unable to attend meetings, consider at least becoming a member: Individual: $10, Family: $15, Business: $50, Lifetime $75 (per person). Checks should be made out to Friends of Hubbard Free Library. Donations may also be made electronically by clicking on the Donate Button above. Our capital campaign is winding down, but it’s not too late to contribute! While donations received thus far have enabled us to replace the 130-year-old slate roof, replace our ancient boiler with two excellent new ones (no more having to wear gloves in the library in the dead of winter! ), and replace the noisy, defective heaters in the children’s room, much still remains to be done, including repairing the chimney, restoring our beautiful windows which, alas, are not as tight as they should be, and installing a handicapped-accessible restroom. Donations can be made by check or made electronically by clicking on the Donate Button above. All donations, no matter what the amount, are greatly appreciated. There are numerous methods of making charitable gifts, many while retaining income interest, with current tax deductions generated for remainder gifts. Charitable Remainder Annuity Trusts, Remainder Unitrusts, Pooled Income Funds and Gift Annuities are some examples. For information on these and other possibilities please see the link for Kennebec Wealth Management (contact Sam Tippet).